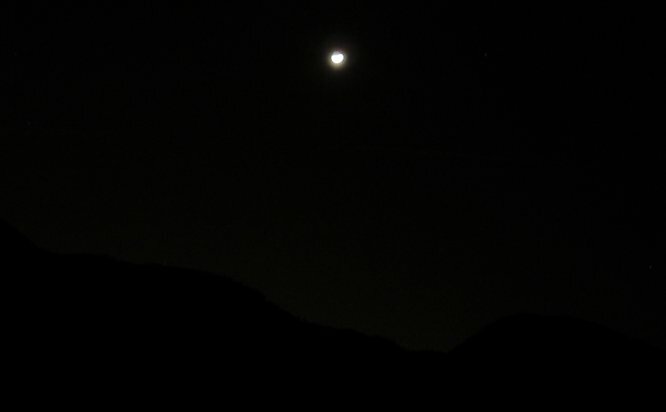 When I got back from the Condor Peak hike, it had gotten quite dark and the moon was overhead. I played with the camera a little bit. 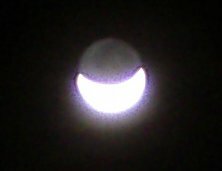 Just letting the camera choose its own speed, the moon is easy to see. I was holding the camera against the car to try to get this at first. 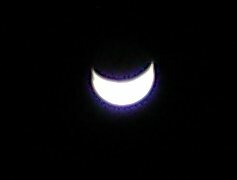 Since the shutter isn't open so long, it almost worked. Result was generally fuzzier than this. After playing with night mode, I tried again with this normal picture setting but this time making it pause for a long time between the press of the shutter and the photo so I could take my hands away from the camera before the picture was taken leaving it just resting against something. Plants, in this case, which isn't ideal. In between I played with the "night mode" which seemed to open the shutter for about six seconds. This turned out to be too long to try to hold the camera, even braced against something. That's when I found the plant to hold the camera for me. There's some fun moon smears from the efforts to hold the camera. This one is zoomed in so there's no mountains as well. Without the camera zoomed, the mountains were also in the frame. There was still a little bit of light coming from behind them so they can be made out in the long exposure that is "night mode". Taking off for a nice drive and a little hike, I headed for Mount Gleason. Which hopefully wouldn't be too high for snow. The plan was to take the trail down from Deer Spring, which goes along the canyon I hiked last week. The road is off the old crest highway. Even though the local mountains aren't so high, a few were obviously a little splotched with snow especially on the north side of the mountains. As the road wound up, it quickly gathered its own splotches nearby. They seemed to get thicker and then as the road passed into a north side slope it became clear it had been plowed. So it's looking good for getting to the trail, but not so good on actually traveling down it. Luckily it is down and a southern slope, so it might be okay. On the other hand, a canyon will generally keep snow longer. Anyway, see when I get there. But I didn't get there. Turns out the road is only plowed to "County Camp No 16" which is also where the pavement goes, but that is not the way the public is allowed to go. The public follows the dirt bypass road to the left which the plow parked to the right has not gone down. Little Scion wasn't going to make it over the foot or so of snow and it wasn't likely to be plowed again on the other side. But it is pretty. The view south from Mt. Gleason, looking out over the city, though none of it is actually visible under a blanket of fog. Myself and a crew of one decided to head up to Trail Canyon to see the waterfall about two miles along. He offered to drive up there, but I knew he wouldn't like to have his car on the last bit of road so I insisted on driving. When we got out he confirmed that he wouldn't have wanted to drive down that road and I probably shouldn't either. Unfortunately for my car, my philosophy is that it exists to get me where I want to go, and if that means a rough but passable road, then that is what it will go down. There is some parking at the start of the road for those who do not wish to beat up their cars, but I have rarely seen it used. The public road stops just before the first crossing of the creek. I could only recall crossing the creek a couple times on the first trip up this canyon, this first crossing being one of those times. It was the hardest crossing, and the current water level made it especially difficult. The current water level also made the far more than a couple crossings after it quite obvious. We worked our way up the canyon, crossing the creek over and over and over again, eventually making that last crossing and started climbing up out of the canyon heading for the top of the waterfall. 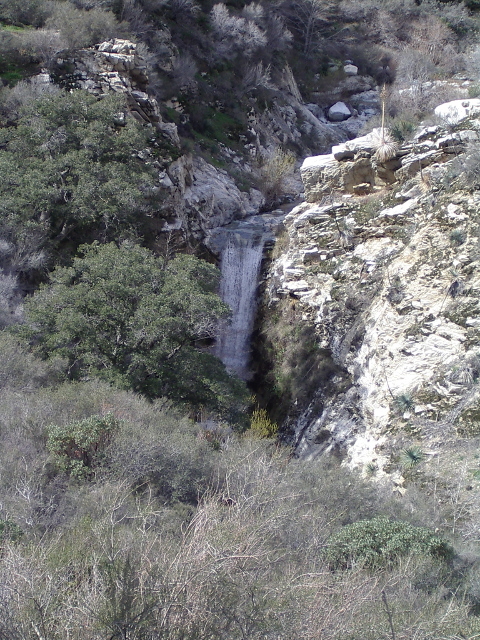 After climbing, the trail turns a corner to reveal the waterfall below it.